AS always, one can count on the (w)academic community – intellectual “acanemics” – to propagate the most outrageous falsehoods, all in order to push through their ideological objectives. In fact, historical truth is as valued as soiled toilet paper. INHERENTLY, anti-American/anti-western profs lend “intellectual” cover to Islamic supremacists/jihadists. Dangerous reprobates. BUT when you factor in enumerable Islamists educated in the west, the landscape becomes even more ominous. Deadly. IN this regard, they selectively bare their Islamic fangs before certain audiences, yet, their western educated silvery tongues – honed via their pedigrees – convince many that they are “reformers”. Moreover, some attended (and teach) at the most prestigious universities, garnering them even bigger megaphones and wider prestige. Mind you, to those who are paying attention, it puts paid to the hogwash that Islamists are deprived, uneducated, alienated and otherwise disadvantaged! John Kerry said it would be a mistake to link Islam to criminal conduct rooted in alienation, poverty, thrill-seeking and other factors. ENTER, Tariq Ramadan (via this linked video), as slippery as a snake, opining that “Islamophobia” is a root issue to examine, yet feigns “moderation” in this and that. Oh yeah. Orwellian doublespeak. 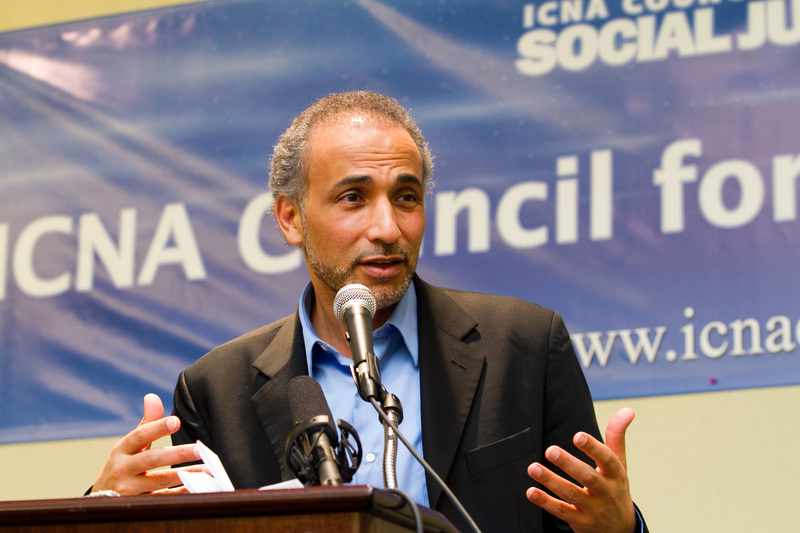 MOST significantly, Tariq Ramadan….hold onto your seats…is the GRANDSON of the Muslim Brotherhood’s founder Hassan al-Banna!! YES, it must be understood how earth shaking this factor is, as he is an heir apparent to the most dangerous (worldwide) Islamic umbrella/front group, bar none. Regardless, Barack HUSSEIN Obama gave him open sesame, as indicated below. AS expected, Islamists, whatever their stripes, can’t stay away from Muslim Brotherhood and other associated terror groups: Ramadan headlined at ICNA! ICNA has established a reputation for bringing anti-American radicals to speak at its annual conferences. Moreover, experts have long documented the organization’s ties to Islamic terrorist groups. Yehudit Barsky, a terrorism expert at the American Jewish Committee, has said that ICNA “is composed of members of Jamaat e-Islami, a Pakistani Islamic radical organization similar to the Muslim Brotherhood that helped to establish the Taliban.” (Pakistani newspapers have reported that Khalid Shaikh Mohammed, a leading architect of the 9/11 terrorist attacks, was offered refuge in the home of Jamaat e-Islami’s leader, Ahmed Quddoos.) On September 27, 1997, another Pakistani Islamist leader, Maulana Shafayat Mohamed, played host to an ICNA conference at his Florida-based fundamentalist madrassa (religious school), which served as a recruitment center for Taliban fighters. In 2000, CNSNews.com made public a press release, originally posted on a Middle Eastern website, from a July 2000 ICNA meeting, which read: “Jamaat e-Islami’s supporters have an organization in America known as ICNA …” The press release also recounted some of the views expressed at the aforementioned ICNA meeting. These included an exhortation that “Islam must be translated into political dominance”; pleas for support for “jihad” in “Chechnya, Kashmir, Palestine, Iraq [against U.S. forces], southern Sudan, and … in Bosnia/Kosova [sic]”; an appeal for unity among Pakistani Muslims against “Hindu Brahmins and Zionist Jews”; and an endorsement of Muslim women’s inclusion in carrying out jihad. One Islamic leader present at the ICNA event complained about “human rights violations” being carried out by the U.S. government against the terrorist mastermind Omar Abdel Rahman, spiritual leader of Egypt’s Islamic Group. In part because of such revelations, ICNA is now under investigation by U.S. authorities for possible connections to terrorist groups. In December 2003, the U.S. Senate Finance Committee requested that the Internal Revenue Service provide detailed information on 25 U.S. Muslim organizations, including ICNA….. DESPITE the above – or more accurately due to it – Barack HUSSEIN Obama opened America’s gates to Ramadan, a Swiss citizen of Egyptian Muslim Brotherhood legacy! IN the main, you gotta thank said Islamic supremacists for slipping up, even though Tariq Ramadan believes that his doublespeak via taqiyya is lost on clueless Americans. In other words, while some are more “in your face” than others, their Islamic designs are one and the same: a global caliphate under Shariah Law! SO realize that another linked video clip, by leading British Islamist Anjem Choudhary, is a mirror image to Ramadan. Choudhary is the same jihadist who was cited in an intelligence analysis this investigative journalist was part of. It was not for nothing. INTRINSICALLY, when one is less than 6 degrees separated from “43 Islamists on trial for a Euro-terror plot” (for starters), well, others would do well to hear what he (they) have to say. Indeed, they mean (Shariah law) business. BOTTOM LINE: it is always, hands down, better to know with whom you are dealing, thus, to internalize where you stand. IN effect, just like Choudhary lays it on the line, so too does Tariq Ramadan. A host of others alike. Agreed, some choose to come out in full Islamic garb, while others charm with their smooth-style western clothing and affectations, yet, their final messages are still the same:submission to Allah! IS it any wonder why the Islamist-in-Chief granted him a visa and embraces these same brothers in the Muslim Brotherhood Mafia? This entry was posted in Uncategorized and tagged Anjem Choudhary, anti-American/anti-western profs, Barack HUSSEIN Obama & Tariq Ramadan, http://freedomandlibertylive.blogspot.co.il/2015/02/obama-cooperates-with-grandson-of.html, http://islamexposed.org/2015/02/01/obama-cooperates-with-grandson-of-muslim-brotherhood-founder-ramadan-exhorts-colonizing-u-s-canada-fbo-islam-commentary-by-adina-kutnicki/, http://joeforamerica.com/2015/02/obama-cooperates-grandson-muslim-brotherhood-founder-ramadan-exhorts-colonizing-u-s-canada-fbo-islam/, http://www.freerepublic.com/focus/f-news/3252842/posts, http://www.israelsvoice.org/2015/02/01/obama-cooperates-with-grandson-of-muslim-brotherhood-founder-ramadan-exhorts-colonizing-u-s-canada-fbo-islam/, intelligence analysis, Islamic umbrella/front group, Muslim Brotherhood Mafia, Muslim Brotherhood's founder Hassan al-Banna, MUSLIM SUPREMACIST TARIQ RAMADAN says: “We are not here to adopt Western values-we are here to colonize the U.S. (and Canada) and spread Islamic sharia law”, Ramadan headlined at ICNA, Tariq Ramadan (via this linked video), Tariq Ramadan - www.facebook.com/pages/Quoting-Islam by Adina Kutnicki. Bookmark the permalink. Pingback: Israel's Voice | Obama Cooperates With Grandson of Muslim Brotherhood Founder, Ramadan Exhorts COLONIZING U.S./Canada FBO Islam! Pingback: Israel's Voice | HUSSEIN Obama’s STEALTH Shariah Law Subverts “U.S. Oath Of Allegiance”: Hail To Shariah States of America! Pingback: Israel's Voice | HUSSEIN Obama’s ISIS Monsters: Zeroing In On Nuclear Terror! Who Is Going To Stop Them?